Normally, for me, food shopping is a chore. But on Saturday mornings outside the church square, it’s an adventure. 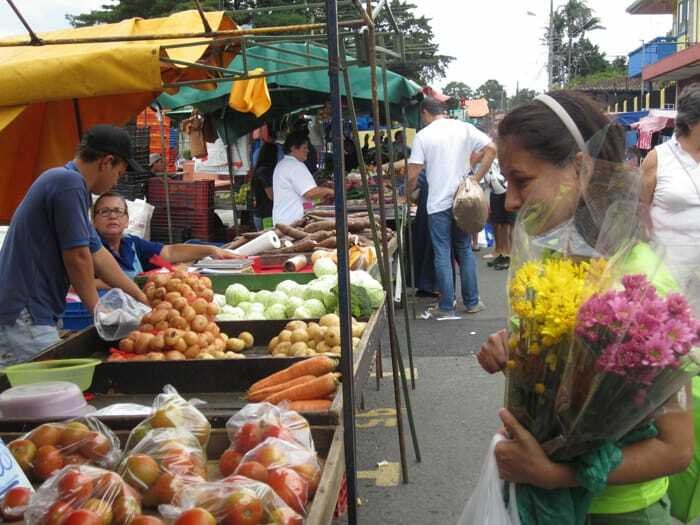 The feria, the weekly outdoor market, is a people watcher’s paradise, and when it comes to finding your favorite fresh fruits and vegetables straight off the farms, there’s no beating it. It’s 9:40 in the morning and I wish I’d gotten out of bed just a tad earlier to miss the crowds. I squeeze and swerve through the throng, dragging my rolling cart like a drunken flight attendant on a mission. I know I’m supposed to be ticking items off my list, but my first stop has to be a fresh pipa filled with icy, sweet coconut milk. 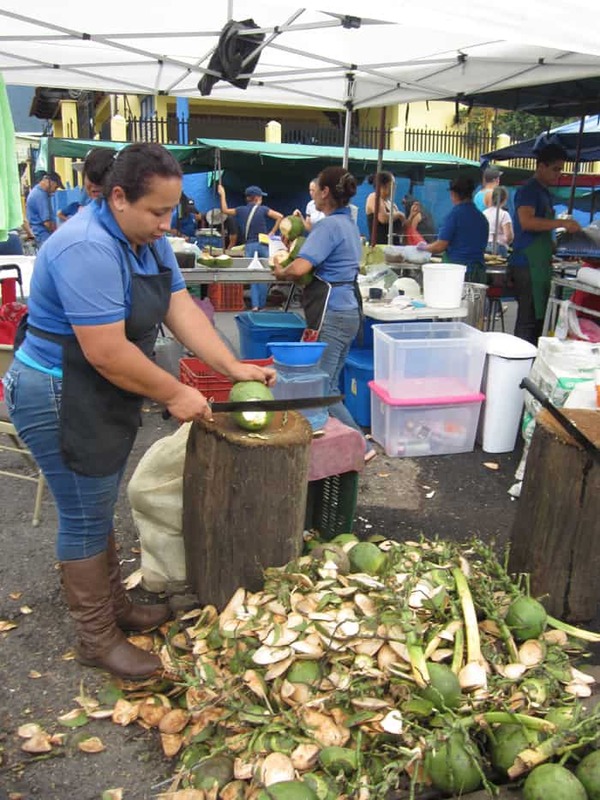 At the little corner stand, the hawkers go through piles of green coconuts each feria morning, lopping off the end with a hefty machete and popping a straw through the hole at the top. When I finish my drink, I stand amazed as a middle-aged woman hacks open my coconut. She wields a machete like it was child’s play, chopping off a “spoon” from the side of the husk, and hands it to me to scrape out the goopy contents. “How many coconuts do you think you’ll sell today?” I ask. “Depends. Today, probably between 800 and 1000 pipas,” answers Mary Nuñez. “Is it true?” I ask. “Are you a dancer?” In response, Nuñez takes a couple of swift salsa steps and nods at me seriously. I finish off my pipa and throw away the husk. But while I’m in an eating mood, I might just pick up a hot pupusa, a Salvadorian hot pocket filled with cheese and beans and topped with spicy repollo coleslaw. It’s kind of like a Latin American heart attack packaged in a corn tortilla and, boy oh boy, it’s delicious. I’ll throw in a healthy drink to wash it down: a mix of freshly squeezed orange and carrot juice, too sweet to pass up. I really ought to get this shopping done. Starting with the salad fixins’, I find a steal of a deal on dark, leafy kale and pick up same basil, cilantro and spinach at my favorite “greens” stall, all of which totals about 1000 colones, around two bucks. That’s a fraction of what I pay at the supermarket. I’m choosy about the tomatoes, layering my bag with the greenest on the bottom to ripen slowly, then the taut ones with the orange tinted skins, and finally, the star of today’s gazpacho: the red, plump, ripe ones. I throw in cucumbers, green peppers, avocado and some fresh goat cheese from the cheese lady. Fresh fruits are next. The seasonal fruits always remind me of the passing of time — one month it’s deep purple, fleshy mangosteen; later it’s hard, crunchy mountain apples. 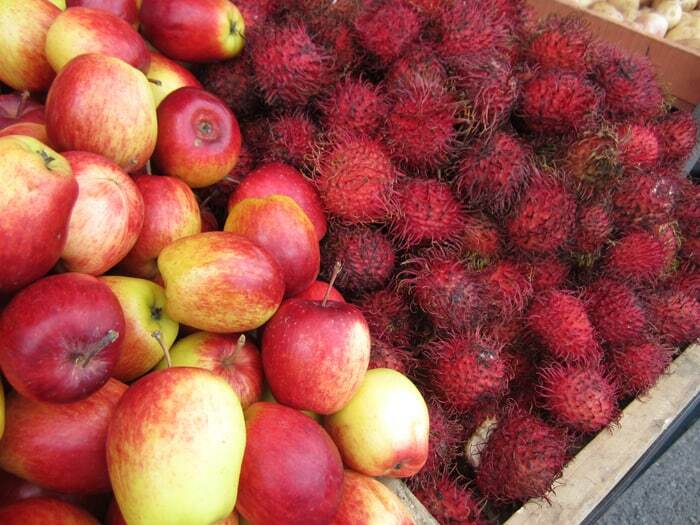 For now, I’m thrilled to see the spiny, red peel of the mamón chino (rambutan) gracing the stand, and I sample the leachy-like sweet meat inside. The taste reminds me of sweet and sour gummy candies that I hoarded in my underwear drawer as a child. I pick up papaya and mango to chop into bags for the freezer. I plan to add lime, banana and orange juice to the blender to make a batido, a frozen fruit shake. Maybe throw in a dash of rum on the weekend. I deserve it. I’ve gotten here too late for the tuna, which is usually gone by 9 in the morning, but my fish guy still has plenty of corvina (seabass). He knows his fish, and he steers me toward the tilapia for the ceviche I’m craving. My plant guy hangs out right near the market entrance, enticing me with exotic orchids with blooms that resemble alien creatures. They bloom over and over, and are a steal at about 5,000 colones. Arrive early in the morning for the best choices. The vendors set out their wares beginning around 6 or 7ish in the morning, when you’ll find room to maneuver and great selection. 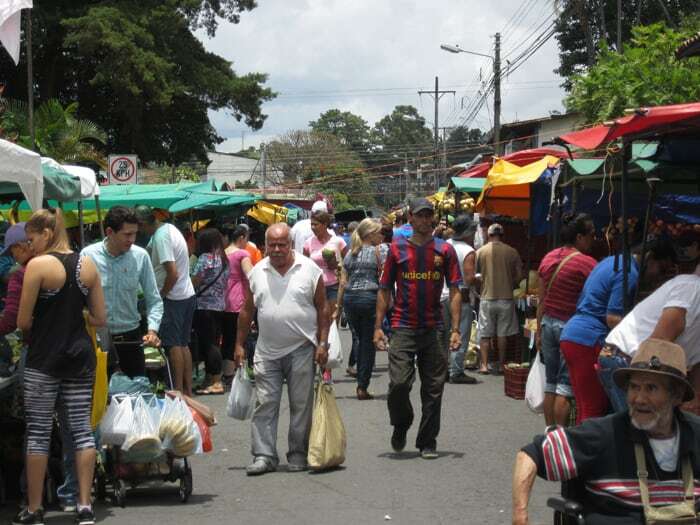 By 10 a.m., the market, which lines the two or three streets near the central Escazú church, is thick with people shopping, selling lottery tickets, hawking produce and stopping to chat. 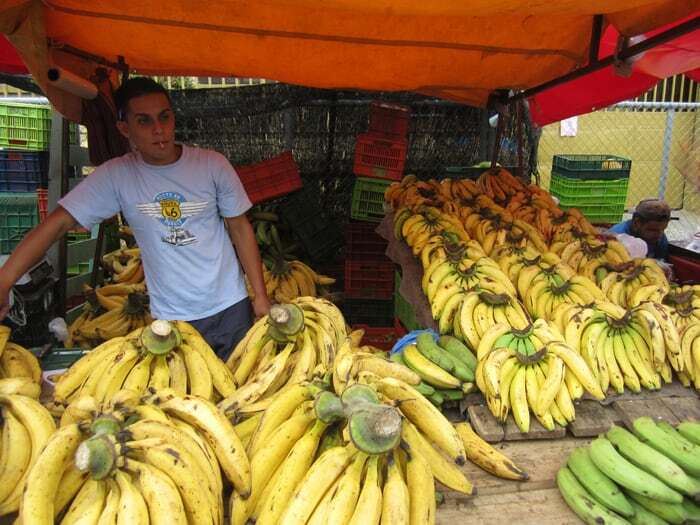 By noon, you can get some sweet, last-minute deals (papayas: five for 1,000 colones!) but the pickings are slim, and by 1 o’clock, it’s all over. In the bordering park, kids swing from the playground equipment, and older men in hats argue on benches in the shade. 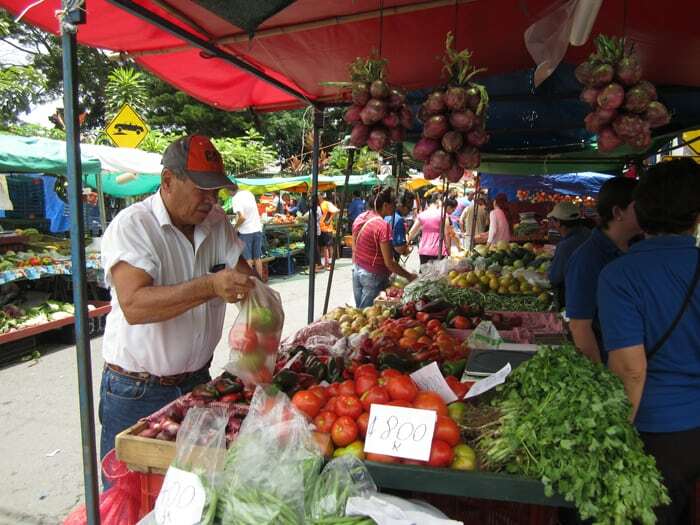 The stalls thrum with noise and tables set with fresh produce spill a cornucopia of colors into the market. The scene reminds me of the vibrant oil paintings you see in folksy art stores: a vision of idyllic life in Central America. Only it’s real, and it’s free. Feria del Agricultor, outside the central Escazú church, Saturday mornings, 7 a.m.-1 p.m.
Feria del Agricultor, Santa Ana, Avenida Central and Calle 1, Sunday mornings, 7 a.m.-1 p.m. In this column, schoolteacher and mom Ilana Long explores fun things to do in Costa Rica that cost absolutely nada. Contact her at ilanalong@hotmail.com.